Davis’ willingness to go forward with a vote on the sewer pipeline and other sewer issues before January puts pressure on opponents and proponents of the sewer pipeline to influence the outcome of the special election now underway to fill the vacant position on the Board. Commission candidate Chuck Horton has said he is opposed to the Calls Creek sewer line and will not vote to condemn property to run the sewer line down the creek. Candidate Ben Bridges initially did not take a stand on the sewer line but said last week that “the last thing” he wants to do is condemn property for the project. Many landowners have said they will not sell the needed easements, which would force the county into condemnation. Candidate Marcus Wiedower has said he will not vote to go forward with the sewer line until other options have been considered. Early voting continued at a fast pace today, with another 575 persons casting a ballot on top of the 583 yesterday, bringing to 1,158 the number of voters who have cast their ballots in the first two days of early voting. That 1,158 represents 4.2 percent of the 27,845 registered voters in the county. If one candidate gets more than 50 percent of the vote in the Nov. 8 special election, that candidate could be seated on the Commission almost immediately and could join sitting Commission members Luke, Mark Saxon and William “Bubber” Wilkes. If none of the three candidates gets a majority on Nov. 8, a runoff between the two top candidates will be held on Dec. 6, after which the successful candidate can join the Commission. Davis votes only in the case of a tie, which would occur with a three-person Commission only if one of the commissioners recuses himself. With a four-person Commission, Davis would get a chance to vote if the new Commission member found one other ally who wanted to go forward with the pipeline or any other decision on the future of the county’s wastewater treatment facility. McGarvey wrote to Davis on Oct. 14 saying that he had spoken with incoming BOC Chair John Daniell, incoming Post 1 Commissioner Mark Thomas, and candidates Bridges, Horton and Wiedower after the candidate forum the night before. McGarvey said four had said the Board should delay making a decision, and one said he didn’t thank any decision would be made until 2017. McGarvey didn’t say more specifically how the five had answered. Davis said in his email response that he didn’t know if the Utility Department or its consultants will have enough information to act by Dec. 31. “If they do, I do not have an issue with the current Board of Commissioners acting on any issue,” Davis wrote. “This Board of Commissioners were elected to serve the citizens of Oconee County until December 31, 2016 when their term ends,” Davis continued. “ All five members of the Board were elected during the past four years with one resigning his post position to run for the to be vacant Chair position. I also am confident that when information is presented to the current Board, those who are newly elected will be exposed to the same information. “With that being stated, I am ready to fulfill my obligation to the citizens of Oconee County and act on any issue brought to the Board of Commissioners,” Davis wrote. 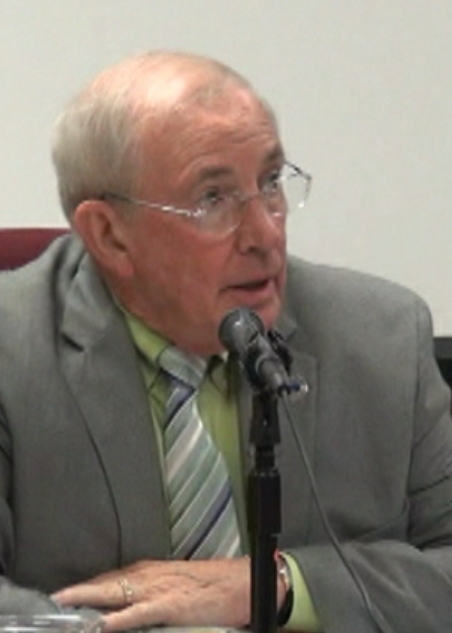 Davis controls the agenda for the Board. McGarvey had sent his letter to Davis to the Friends of Calls Creek, a group he helped organize, early this morning. He sent out the reply from Davis this afternoon. Friends of Calls Creek has been vocal in its opposition to the county’s plans to run a sewer pipeline down Calls Creek as a means of getting treated sewer water to the Middle Oconee River. The county operates a treatment plant on a ridge about Calls Creek on the northern edge of Watkinsville. I asked each of the three BOC candidates in one-on-one interviews I did late last month what each would do if the county did not get permission from the state Environment Protection Division to discharge additional treated waste into Calls Creek. The EPD denied that request in a letter dated Sept. 23, 2016, but the letter had not been made public when I did the interviews. The responses of the three candidates are pulled together in the video clip below, starting with Bridges, followed by Horton and then Wiedower. That is the order in which the candidates scheduled their interviews. The question I asked of all three is at the front of the interview with Bridges only. I did not eliminate any part of the response of the three candidates. The slight gap in the middle of the Wiedower interview results from the camera completing one file and starting another. OCO: Three Candidates On Calls Creek from Lee Becker on Vimeo. Moderator Charles Bullock did not ask the candidates specifically how they would vote on the sewer line at the forum on Oct. 13, but he did ask about sewer capacity. In his response to Bullock, Horton said he would not condemn property to put the sewer line down Calls Creek. Bridges said condemning property was the last thing he wanted to do and he would try to find alternatives. Wiedower did not mention the Calls Creek sewer line in his answer. The video of the responses of the candidates is below. OCO: Calls Creek At Candidate Forum 10 13 2016 from Lee Becker on Vimeo. I have created a channel on the Oconee County Observations Vimeo site that includes the complete video of the Candidate Forum on Oct. 13 and of the interviews with the three candidates. Other videos related to the Nov. 8 election also are on the channel. Sooooooooooo typical of King Melvin of Oconee. Horton has a chance to win, and Melvin is going to do his best to make sure the Calls Creek decision is made before he no longer controls every BOC vote. Bubber will vote as Melvin instructs him (even after Melvin leaves office). Saxon is wishy washy. Luke is a wild card. Very unfortunate that Marcus has accepted $1,000 from Melvin's campaign manager. i would think that the new board could vote to rescind any decision made by the old board, particularly one that clearly is not in the best interests of its citizens. a sewer down calls creek is not now nor has it ever been in the best interests of its citizens. Wow, a very bodacious move before retiring. Caught me by surprise to say the least. I thought Wayne Haynie was going to meet a citizen group around the 26th to discuss options, I believe he just cut his Directors throat. I hope this prompts those opposed to this project to get out the vote for Mr. Horton. He needs the 50% and the current establishment is opposed to him and will work against him. Mr. Bridges is a fine man, but I don't think he has a realistic chance and he is very inexperienced in county government. Mr. Wiedower is clearly the establishment choice. I was expecting a lively comments' section this issue, and it is so. It is plain that a No vote after January will not pass. Mr. Weidower will not meet a re-zone beneficial to a builder he won't like. One can only wonder how the sewer line benefits Mr. Davis except for being able to sell more access to business building. Daniell, Bridges, Horton & Wiedower: Make a public statement requesting that Davis, Bubber, Luke & Saxon hold any vote on Calls Creek until the new commissioner is in place. Republicans refused to allow the President to appoint a Supreme Court judge with a year left in his term. Republicans Davis, Bubber, Luke & Saxon could and should follow this Republican precedent and do the same with Calls Creek. Cals Creek is a long term concern with many complexities. Melvin trying to rush through a vote now is remarkably irresponsible...but par for the course. Don't let the door hit you on the way out. Here 'ya go Daniell, Bridges, Horton & Wiedower: Step up and lead! Publically and forcefully request any vote on Calls Creek, or any other major county commission decision, be held until the new commission is fully seated. asking why the rush to vote for sewer expansion. We received a reply from Chairman Davis. Thanks for your comments regarding the candidate forum last week. I also appreciate your inquiry. Yes, at this point in time, sewer capacity is a relevant issue as it has been for a number of years. Most decisions made by a Board of Commissioners has a long term effect on the county. As you know, when the decision was made in the late 80’s and early 90’s to partner with Barrow, Athens/Clarke and Jackson County to build the Bear Creek Reservoir it had a long term effect on Oconee County. That same thing could be said with the agreement to partner with Walton County and the Hard Labor Creek Reservoir. Similarly, with the building of OVP, widening of Mars Hill Road, building the Oconee Connector and the decision that must be made for a future County Administrative Building are just a few other decisions that have a long term effect on Oconee County and its citizens. As you also know, there are many studies initiated regarding sewer projected needs as well as sites for future wastewater expansion facilities. We did receive an allocation from EPD to discharge up to 1.5 mgd of treated wastewater into Calls Creek. You also know that the current limits of our Calls Creek Treatment facility is 667,000 mgd. The Board has already authorized the design of a plant that can produce the 1.5 mgd limited discharge. I do not have definitive projections of how long sewer treatment capacity at Calls Creek and the LAS site will serve the needs of Oconee County. I do not know if our consultants or our Utility Department Director will have sufficient information to the BOC to discuss and act on recommendations by December 31, 2016. If they do, I do not have an issue with the current Board of Commissioners acting on any issue. This Board of Commissioners were elected to serve the citizens of Oconee County until December 31, 2016 when their term ends. All five members of the Board were elected during the past four years with one resigning his post position to run for the to be vacant Chair position. I also am confident that when information is presented to the current Board, those who are newly elected will be exposed to the same information. With that being stated, I am ready to fulfill my obligation to the citizens of Oconee County and act on any issue brought to the Board of Commissioners. You do recall, that in Oconee County, the Chair only votes in case of a tie. With three sitting commissioners, I am aware that I may not have a vote on any issue unless a Commissioner recuses himself due to a conflict of interest or is absent from the Board meeting. Jim, again thanks for your inquiry and if I can share more insight, please give me a call. I completely agree with Anonymous! I'd love to hear from the candidates. Melvin Davis should not be allowed this Power Play! Government FOR THE PEOPLE BY THE PEOPLE! Hoping for MUCH needed change in November! After reading the WHOLE letter to Jim Mcgarvey, it doesn't seem to me quite as dastardly as some would imply. We will simply have to watch and see what the recommendations are. I agree with outsiderlookingin... Why didn't Lee shares the entire, unedited letter? He was clearly picking and choosing select quotes that would give his audience fuel for a frenzy. This is clear example of the "Gotcha Journalism" that makes people question what is presented as "fact" but is really a biased point of view pushing a skewed narrative. I used the two paragraphs in which Davis states his position on McGarvey's request almost in their entirety. The first paragraphs in Davis' letter have little to do with the request itself. McGarvey asked Davis to postpone a decision. He said he would not. Anonymous 8:51, Im sure if Lee printed the entire letter you would still feel the same.